Anne Gilman is a Brooklyn-born artist who works in varying formats that include large-scale drawings and multi-panel projects. The political, social and personal concerns that fuel all forms of moods, worries, and psychological states of being are the materials that feed her work. She begins by using her own thoughts and experiences as a starting point for considering larger issues of why we do what we do, what matters and how we can get lost in distractions that are ultimately unimportant. The resulting drawings are a mapping of information, thought and emotion. Gilman’s work has been included in numerous solo and group exhibitions throughout the United States, Latin America, and Europe including Mexico, Havana, Berlin, Paris, Chicago, Philadelphia and New York. Recent solo exhibitions include Up close / in the distance / now, at the Birmingham Bloomfield Art Center outside of Detroit, In any one day, how all the things get mixed together, at Five Points Gallery in Torrington CT; Descifrar/ to decipher, decode, figure out at Instituto Cervantes in NY where she created a floor drawing onsite incorporating noise, conversations, and interactions with visitors as part of the work; and The Jolly Balance, a featured artist project at The Center for Book Arts in NY. Recent group shows include Boundless at Central Features Contemporary Art in Albuquerque, NM; Subtle Formations at Kean University, NJ; and Start here, a 3-person show at Lesley Heller Workspace, NY. Gilman was a recipient of a Fellowship from the Edward Albee Foundation in 2010, a MacDowell Fellowship in 2012, a Chenven Foundation award in 2015, and a Two Trees Cultural Space Subsidy Program in 2017 for her commitment to community outreach. 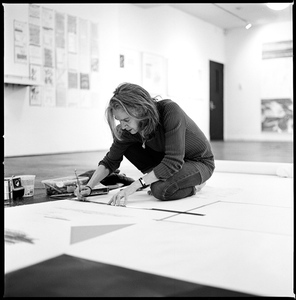 Her work has been featured in Hyperallergic, Art Spiel, Bomb Magazine, TECA/ Testimonianze Editoria Cultura Arte, Guernica Magazine, Publishing Perspectives, Prattfolio, and the Spanish-language magazine, Literal and is in the collections of The National Museum of Women in the Arts, The Brooklyn Museum, New York Public Library, Azerbaijan Museum, and The Library of Congress. She has spoken on numerous panels about her work including at Ediciones Vigía in Mantazas, Cuba, The Kresge Art Museum in Michigan, Abrons Art Center in NY, Munson-Williams-Proctor Arts Institute in Utica, NY, Tribeca Center for the Performing Arts in NY, The Center for Book Arts in NY, Delaware Center for the Contemporary Arts, Wilmington, LARVA in Guadalajara, Mexico, The Brooklyn Public Library, Instituto Cervantes, and at Cranbrook University. A bilingual version of her artist book, Frayed Edges, was published by Ediciones Vigía in Matanzas/Cuba and her artist book, “this place / this hour,” 2019, will be included in an exhibition later this year commemorating the 200th anniversary of Walt Whitman. She currently teaches in the graduate program at Pratt Institute and has her studio in the dumbo section of Brooklyn as part of the Two Trees Cultural Space Subsidy Program.